The folks at Powerline realized the implications of an outrageous news clip featuring NBC's Tom Brokaw conducting an interview with the Obammessiah. Apparently, this hard news journalist thought he'd get deep and ask a pertinent question about Israel, the Palestinians, and just what it might be that the Jews can learn from Obama's visit to Buchenwald and how they should treat Palestinians and stuff about Nazis or something. Seriously, what sort of historical ignorance does it take for someone to ask what Jews can learn about Buchenwald from a guy that has never visited the place before now, never had any intimate or even cultural connection to it, and wasn't even alive when it was a Nazi terror to the Jewish world? I mean, is Brokaw insinuating that the Jews did not learn anything from their own "visit" to Buchenwald? And what sort of insensitive fool does it take to imagine that Jews have any new "lesson" to learn of Buchenwald that it has yet to learn? And how is it that Obama can be their teacher? The thought of it all is ludicrous. But, let's get down to brass tacks, shall we? The singular point here is that Tom Brokaw just implied that Israel is treating the Palestinians just like the Nazis treated them! That is the true outrage here. 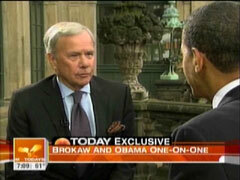 And I have to give President Obama credit for being smart enough not to take Brokaw's bait, too. BROKAW: What can the Israelis learn from your visit to Buchenwald? And what should they be thinking about their treatment of Palestinians? OBAMA: Well, look, there's no equivalency here. Of course, the proper response would have been to force Brokaw to more clearly make his point and then to ridicule him for being an idiot right on the spot. But, we can't expect Obama to scold his lapdogs too harshly, I guess. If you don't want to endure this insufferable man (I know, which one, right?) scoot ahead to about 4 minutes into this journalistic tour de force.